Home » Writings » The West and Russia: a Divergence of Values? Published in Eugene Pustoshkin’s Eros & Kosmos e-zine, August 2014. Click here to read it in English on the Eros & Kosmos site. Click here to read Part 1 in Russian and here for Part 2. It’s difficult to write an article triggered by, but not about, an ongoing crisis that has no obvious outcome in any predictable timeframe. The Ukrainian army may be gaining ground but the United Nations’ concern about a growing humanitarian crisis may force them to slow down their assaults – perhaps helped by rockets fired at them allegedly from across the Russian border. The brutal fact is that West is not going to go to war over the low-level but brutal civil war in eastern Ukraine. The West is likely to continue to support Kiev diplomatically and with military supplies and intelligence and there will be reluctant incremental upgrades to the European Union sanctions on Russia (and retaliatory Russian sanctions on the West); but no American or European soldiers are going to die for Donetsk or Luhansk, even if there were to be an overt Russian military incursion. Russian militiamen causing trouble in the Baltic states could be a very different proposition, though. Treaty obligations would almost certainly mean any of the Baltic states suffering a secessionist insurgency driven by Russian irregulars and powered by Russian arms would be able to call on NATO to help defend its territorial integrity – provided it could be demonstrated convincingly that a ‘foreign power’ (Russia) was threatening that territorial integrity. And, while no one in their right mind would want it, military skirmishes on the borders of Latvia, Estonia and Lithuania could easily spiral out of control and into real war. Part of the challenge, then, is to undermine the Russian ultra-nationalism which is fuelling the insurgency in eastern Ukraine before it spreads further. A second part of the challenge, though, is to find ways for Russian nationalism to be expressed safely and healthily without terrorising Russia’s neighbours. For these things to happen, the West has to understand Russia and respect its interests. Western media need to stop treating Vladimir Putin like some neo-Adolf Hitler and Western governments need to support Putin in reigning in the ultra-nationalists by ameliorating those factors which feed Russian ultra-nationalism. Putin himself will need to take substantial risks. When the Soviet Union finally collapsed in 1991, the West – and the United States in particular – read this as Communism having been vanquished by Capitalism. It was a simplistic narrative that suited the ultra-free market views of George H Bush in the White House and Margaret Thatcher in Downing Street. In subsequent free market fantasies, it was assumed that Russia, her satellite countries and her former Warsaw Pact partners would become fertile breeding grounds for capitalist memes – memes, essentially, are ideas which infect minds, from individuals to whole cultures. The opening of the first MacDonald’s fast food takeaway in Moscow in 1990 was lauded in the Western media as the first sign of the capitalist infection taking hold. However, if we dig a little deeper, using sociopsychological tools, we can see that the West pretty much got it wrong in the last days of Mikhail Gorbachev’s rule and has largely been getting it wrong about Russia ever since. A key sociopsychological tool for this exploration is Spiral Dynamics, developed by Don Beck & Chris Cowan (1996) from the work of Clare W Graves (1970, 1971). Graves himself was a correspondent and sometime collaborator of Abraham Maslow. Graves influenced Maslow (1971) in his final formulations on the famous Hiearchy of Needs; and Spiral Dynamics incorporates key Maslowian principles, while also building on and extending the Hierarchy concepts quite considerably. In Spiral Dynamics terms, the ultra-free market radical Capitalism that emerged in the West during the time of Thatcher and Ronald Reagan was driven by the ORANGE vMEME. The focus was on individuals achieving strategic goals such as wealth creation and having the better things in life. The assumption made in the West was that, with the collapse of the ordered and repressive Communist police state (BLUE), ORANGE entrepreneurialism and strategic enterprise would emerge as people enjoyed the freedom to better themselves. However, there seem to be few Western leaders with much real understanding of how human motivational systems develop. Maslow established clearly in the original Hierarchy that, when a lower level is in trouble, focus goes down the Hierarchy to deal with the problems. Thus, when the BLUE order of the Soviet totalitarian state was dissembled, it was not so much (higher) ORANGE that dominated in the new freedoms but (lower) RED. This vMEME is self-centred, lives primarily for the moment and does exactly what pleases it with little or no conscience or thought of consequences. In so many ways, it is the epitome of what Sigmund Freud (1923) meant by the Id. Russia suffered years of chaos, instability, corruption and gangsterism as a result of losing so much Soviet BLUE order which then allowed RED to flourish. The inability of Western leaders to read potential scenarios accurately has led to the catastrophic mishandlings of Afghanistan and Iraq. The failure to understand the nature of tribalism, driven by the PURPLE vMEME’s need to find safety in belonging, led to the muddleheaded attempts to implement Western-style Democracy (a vMEME harmonic of BLUE, ORANGE and GREEN working together) in those countries with disastrous consequences. People in those countries voted in the interests of the tribe/sect to which they belonged and as the tribal elders instructed, rather than weigh up the issues and vote on merit in the national interest as true democrats are supposed to do. The anthropological psychologist John Berry (1969) calls this the imposed etic. This is when, a local or regional cultural norm (emic) is treated as a universal norm (etic) when it is not (imposed etic). Closely connected with the imposed etic is the False Value Consensus, a term Lee Ross et al (1977) came up with to describe the assumption that everyone else thinks the same as you and holds the same values you do. Moreover, Ross et al identified the cognitive pattern that, when it becomes inescapable that others do not think the same as you and do not share your values, you regard those who deviate or even oppose your viewpoint as defective. There is something wrong with them because they do not think as you do. Thus, Western leaders denigrate fundamentalist Muslims who have no interest in Afghanistan becoming democratic and are confused as to why Sunni and Shia slaughter each other in Iraq rather than reach a ‘sensible’ compromise through the ballet box. Unwittingly, perhaps, they have made similar types of mistakes with Putin and Russia. In the year before Putin became Boris Yeltsin’s prime minister, Russia seemed to have reached its nadir of chaos. The state had defaulted on its debt and salaries for public sector workers and pensions were being paid months late, if at all. Basic infrastructure was collapsing and the country’s most prized assets belonged to a handful of well-connected oligarchs who ran much of the country like private fiefdoms. Putin recognised that all that (RED) indulgence and dissipation needed (BLUE) order – and that was what the restoration of Russia began with. For Putin, the former KGB officer, putting order back into society – forcibly, if appropriate – was something he prized. International economist Anders Aslund (2008) points out that, in his early years as president and/or prime minister, Putin implemented reforms that cut down crime and corruption, enabled economic growth, cut the cost of the state, created conditions to exploit Russia’s massive gas and oil resources and enabled small-to-medium enterprises to grow year on year by an average of 7%. By reintroducing a more-than-moderate degree of BLUE, Putin facilitated the growth of healthy ORANGE. Anders did note latterly – and with concern – some reversal of Putin’s early reforms, with growth of the state apparatus and increased corruption in some circles – often those somehow connected personally to Putin or his interests. A slew of articles more recently – eg: The Washington Free Beacon’s Bill Gertz (2014) – have made lurid allegations about Putin’s personal fortune being strongly linked to corrupt practices. If true, then this would indicate RED regaining traction in the upper echelons of Russia’s government/business relations. Whatever levels of corruption Russia has endured under Putin in more recent times, the impetus for economic growth seems only to have slowed rather than reversed, with the country a gas and oil powerhouse supply (particularly to the Europeans). As the Daily Telegraph’s Stephen Dalziel pointed out back in 2011, though, Russia’s dependence on gas and oil exports can only be reduced by building up its base of small-to-medium-sized enterprises (SMEs) – just 20% of businesses, compared to 80% in the UK. According to Dalziel, SMEs in Russia are hampered by too much old Soviet-style (RED/BLUE) bureaucracy and there is nowhere near enough development in infrastructure to maximise trade. Militarily, at the time Putin came to power, the once-mighty Russian army had recently lost a war in the would-be breakaway republic of Chechnya, a place with fewer inhabitants than Russia had soldiers. (According to Carlotta Gall & Thomas de Waal in 1997, Russia lost more tanks in the 1994-1995 Battle for Grozny than it did in the 1945 Battle for Berlin!) Three former Warsaw Pact allies had joined NATO, bringing the Western alliance up to Russia’s borders. This was in contravention of Gorbachev reputedly agreeing to German reunification within NATO after being promised that NATO would not expand “one inch to the east” (Johanna Granville, 2000). And it is this expansion of NATO – see graphic below- which nationalists like Putin perceive to be the existential threat to Russia’s sense of self, according to commentators like Stephen Wayne Kasica (2014). Kasica asserts that Putin believes the break-up of the Soviet Union was a catastrophe for Russia and that he wants to turn the clock back and make a new Russian Empire in the territories of the former Soviet Union. Putin has wanted to give Russian back its national pride – a RED/BLUE harmonic. For a people deprived of order and plunged into chaos for so many years, Putin’s rebuilding of Russia also brought in a degree of safety-in-belonging to meet the PURPLE vMEME’s needs. Nationalism in itself is primarily driven by a harmonic of the PURPLE and BLUE vMEMES – usually facilitated by an individual RED/ORANGE self-aggrandiser. Putin has certainly used nationalism in this way to build up his own popularity. The Russian diaspora has given him the means to do this – all those ethnic Russians who found themselves located in the breakaway states when the Soviet Union suddenly imploded. They have often been treated as second-class citizens in their ‘new’ countries – and still are in places like Latvia and – surprise, surprise! – Ukraine (Damien McGuinness, 2014). Putin is increasingly pilloried in the West as a stereotypical egomaniacal tyrant, totally ruthless in pursuing his policies and callous about their human cost. 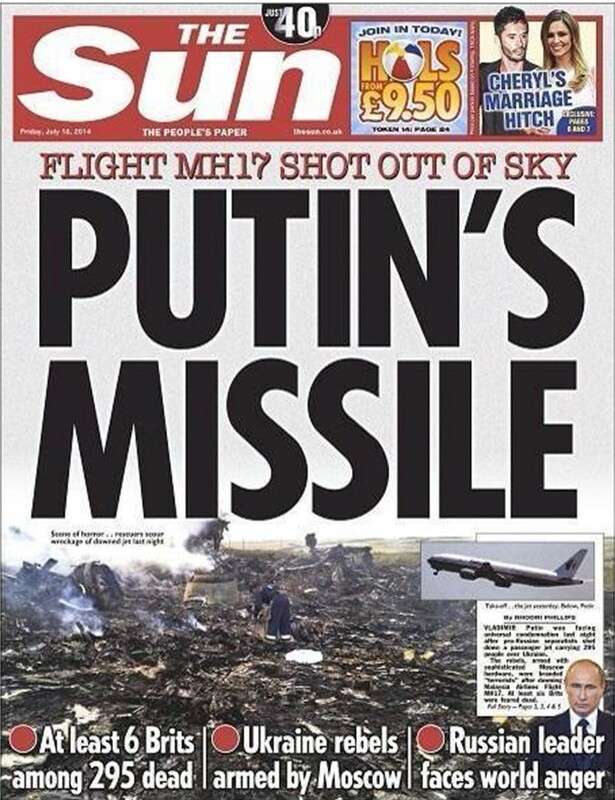 In some tabloids the tragic shooting-down of MH17 has been attributed to him almost as if he personally – and very deliberately – pressed the button. See example below. There are, of course, a number of errors in such caricaturing. Firstly, Putin is a pretty smart operator. So smart it seems he might be capable of what Spiral Dynamics terms 2nd Tier thinking. Both Graves and Maslow drew a sharp distinction between deficiency (Maslow) or subsistence (Graves) thinking and ‘being’ levels of thinking. 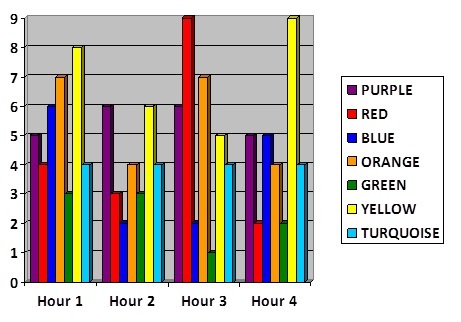 Both researchers attributed greater complexity in thinking as you ascend the Spiral/Hierarchy, with Graves finding that YELLOW had four times the problem-solving capability of GREEN. Last Summer Putin demonstrated particularly-sophisticated thinking in the way he rescued Barrack Obama from his infamous ‘red line’ debacle on the use of chemical weapons by Syrian government forces. While Obama’s government dithered painfully on whether to launch what would probably have been an ineffective missile strike, Putin saved Obama’s face by using his leverage with Bashar al-Assad to push his government into handing over their chemical stock to the United Nations. Putin has demonstrated what might be 2nd Tier thinking in his approach to the Middle East and the so-called ‘Arab Spring’. Rather than join the Western rush to support the supposedly ‘democratic’ revolutions, Putin hung back, observing. If anything – and certainly in Syria – he tended to support the status quo. As the horrifyingly-fundamentalist Islamic State is being carved out of the remains of Iraq and Syria, Egypt is back in the hands of a repressive military regime and Libya teeters on the verge of a second civil war…and the West dithers as to what to do about any of it, Putin’s restraint looks far more the better strategy. A 2nd Tier thinker, weighing up all the competing forces acting upon the players in the various ‘revolutions’, might have discerned that ‘Democracy’ was an ideal to be grasped for but not really grounded in peoples whose thinking was tribal (PURPLE) and who were used to autocratic rule (RED) as the way power works. The paradox then comes: if Putin is a 2nd Tier thinker – and that is ‘if’ – and can demonstrate such complex thinking in international matters, how can he have allowed corruption and restricting bureaucracy to have so re-infected Russian government and business? Many with a limited understanding of Spiral Dynamics struggle with this paradox as 2nd Tier thinking is so often assumed to be beneficent. However, the little evidence of 2nd Tier thinking available does not support this assumption unequivocally. Also, as co-developer Don Beck has pointed out numerous times, the model is about systems within people, not types of people – and those systems work in relation to the life conditions being experienced. Beck & Cowan (1996) use the concept of a vMEME stack to illustrate how different vMEMES will ebb and flow in relation to changing life conditions. Thus, it is perfectly possible that early in his leadership Putin approached Russia’s domestic problems from a 2nd Tier meta-perspective, seeing the need to restrain RED indulgence and strengthen healthy BLUE disciplines to facilitate the emergence of ORANGE. Later, as life conditions offered him the opportunity for personal aggrandisement, that will have appealed to his RED and perhaps, with the Russian economy reasonably stable, allowed him to focus on his personal opportunities – even to the partial detriment of his country. This will be particularly so if Putin is high in the temperamental dimension of Psychoticism, as per Hans J Eysenck’s Psychoticism-Extraversion-Neuroticism model Eysenck, 1967; Hans J Eysenck & Sybil B G Eysenck, 1976). While the relationship between temperament and motivation is relatively unexplored, there is some evidence – eg: N N Trauel, 1961; Keith E Rice, 2006 – that temperament can influence the lower vMEMES. Profiles of Putin – such as those by Kassica and Oliver Bullough (2014) – certainly indicate, with Putin’s ruthless, sheer physicality, demonstrations of ‘machoness’ and an ‘eye for the ladies’ that he could be high in Psychoticism. If so, then, as Psychoticism seems to facilitate the RED vMEME particularly, then Putin will always experience a natural self-orientation even if, when he’s thinking in 2nd Tier, he knows another approach is needed.